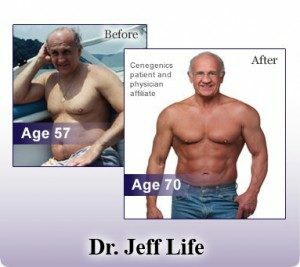 In honor of International Longevity Day, I’m posting this interesting video I did with Dr. Jeff Life, whom I ran into at RAADFest. He wowed the audience with his talk about reinventing himself at age 79 and even took off his shirt to inspire us. You probably know about his award-winning physique and have seen him in airline magazines as the Cenegenics poster child. 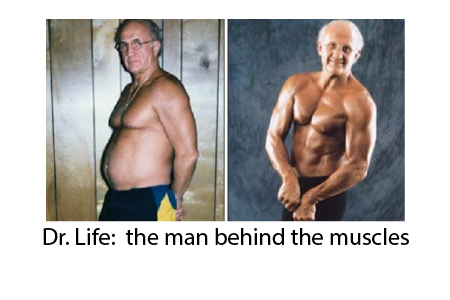 What you probably didn’t know is that after leaving Cenegenics at age 75, he back slid into food addiction, alcohol overuse, and other unhealthy habits that had him gain another 20lbs of fat. Inspired by last year’s inaugural RAADFest, he decided that he would turn it all around again. Dr. Life explains the importance of diet and watching the glycemic index of what you eat. He explains his battle against advanced coronary artery disease with near 100% occlusion of arteries that almost took his life. Now, he monitors progress with blood tests in a way that traditional medicine doesn’t emphasize- by following inflammatory biomarkers BEFORE tragedy strikes. Finally, he explains the importance of measuring telomeres and the importance of the critically-short ends. It is never too late to start again! Just ask the expert you all recognize from the seat pocket in front of you, Dr. Jeff Life! Very inspiring. I appreciate Dr. Life’s candor. I follow a ketogenic diet. 1 point Dr. Life needs to look into: LIGHT, i.e. exercising outdoors, not inside a gym under artificial blue light. Google Dr. Jack Kruse, an authority on light/mitochondria. I agree, outdoor exercise as in trail running / walking is exhilarating. Incorporate your skill set of recreational activities into your weekly outdoor program. Don’t loose sight of the Sun. Think would this be fun if I was outside. ? Then make up your mind to do it and step forward. I am a female seventy five years old I think in good health. I find Dr. Life’s story very inspiring. Does he have a program for women? I think it is gender nonspecific. He is an inspiration!